Happy to oblige, Mac. As I mentioned right here early this year — when Matt and his business partner Jill Buchanan were still in negotiations on their lease — the plan was to open a downtown restaurant and bar within walking distance of Matt’s in the Market, which is no longer owned nor operated by Matt. In May, they signed the lease on the spot they were eying. You may know it as the former Japanese restaurant Koji Osakaya, at 89 University Street, where it overlooks the Harbor Steps between First and Western avenues. Matt Janke and Jill Buchanan have something to smile about: they finally signed the lease on their new restaurant, Lecosho — overlooking Seattle’s Harbor Steps . “I’m basking in the glory of opening a new restaurant!” he told me, laughing into his cell phone. In fact, he’d just been clocked in the head with a piece of flying wood: I’d caught him crawling around in a storage unit, attempting to dig out the bar he and Jill brought back from Idaho months ago. Contractors are on-site at the new restaurant, where the build-out began yesterday, Matt said, noting (not for nothing) that he’s using the same contractor who built the lovely new Sitka & Spruce. If all goes according to schedule (“and you know how that goes!” he yucked), they’ll finish their work in 10 to 12 weeks when we’ll be able to sit at the newly installed old bar and lift a glass and a fork at Lecosho. Granted, that name won’t be rolling off our tongues like the alliterative place-staker “Matt’s in the Market.” But since I’m sure you’re wondering, the name was taken from the Chinook word for pig, or swine, Matt explains. 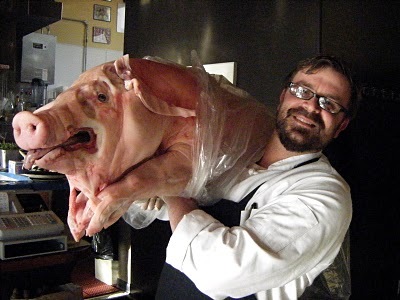 Chet Gerl, the main man in the kitchen at Matt’s in the Market, shouldering Matt’s new-restaurant namesake, a lecosho, before butchering it in-house.